Oahu pilots enjoyed a surprise visit from an enthusiastic foursome of our nearest flying neighbors this weekend, and we all shared an unusually spectacular day at Makapuu on Saturday. We launched on the far side of the lighthouse, and soared there for over an hour in the steady easterly flow, as Mike and Brandt and Leo ran a speed-slalom course around us in their hang gliders. As the light tradewinds slackened and gave way to a more northeasterly sea breeze flow, we all migrated to the main ridge where we passed quite a few more very pleasant hours in the sky with our neighbors from across the channel. We launched from almost every conceivable spot throughout the day. Jim pulled off his first ever lighthouse ridge launch, and it could have been Scrappy's first time there as well, I'm not sure. Reaper pulled off a dramatic toplanding on the lighthouse ridge, relaunched, and then flew over to topland at Cactus where he waited for his students Marc and Ray to hike up for some training flights. Frank launched out of Cactus, as did Chopper Dave and student Ray, before the airflow up there grew too strong. Later on, Maui Rich relaunched from Manics, and Fireman Dave launched there too, in a tandem with his dad, who is here visiting. Jared showed up a bit later and launched there as well. Earlier in the day, McStalker had not been sold on the sketchy lighthouse launch mission, opting instead to check out the conditions at Makapuu's most alternate launch: the one at Kahana! At the end of the day, Maui Aaron took a quixotic stand against power lines, hiking up to the old abandoned Tomato Patch launch to make several heroic efforts to get airborne from there. Finally, Steve, Ginny and Berndt joined us to launch the party at the LZ, as did McStalker after he'd returned from Kahana a bit later. While Maui Jon worked on his aerobatic routines for most of the afternoon, Frank, Abhay and I concentrated on getting high in the gentle thermals at the Waimanalo end of the ridge. We staged some hesitant forays into the back, but I guess none of us had enough fire in the belly to take the full plunge. The clouds had started out the day tantalizingly high above the range, but they gradually sank lower, settling onto the top of many of the downrange peaks by midafternoon. I finally gave up on the hope of growing a pair to lead the way downrange, and I landed just before my bladder exploded, after well over three hours in the air. Around that time Maui Rich and Abhay must have realized that if they wanted a downrange trip, they'd have to go without the locals: as I was landing, they plunged deep into Waimanalo to begin an epic downrange mission to Kaneohe and Kahaluu. To excuse our lack of participation in the downrange mission, the locals volunteered a veritable host of rationalizions: I was waiting for someone else to go first! I bombed out and ran out of time! I wasn't ready to try it for the first time! I had a bad case of cooleritis! I had my 84-year-old dad strapped to me! I had students to train! I'm just a student! Oh, What-Ever. The Maui pilots showed us today that they are made of some bold stuff indeed. I talked to Abhay later (just to torture myself) and he described a fantastic and surreal experience: dodging clouds, navigating around cloud-soaked summits, and finally landing out at Windward Community College in Kaneohe, slightly behind Rich who had made it into Temple Valley. 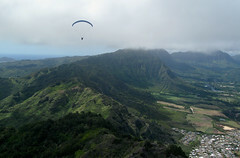 Not only was it Abhay's first time downrange from Makapuu, but he ended up with his longest and furthest flight ever. Great job, guys! I hope next time we can muster some local troops to join you. After a long seven hours at Makapuu, with at least half that time spent in the air, I headed home with my empty cooler to dream of the next time. I would love to see some pictures and read some stories from anyone else who might be inclined to share, especially Rich or Abhay. Or if anyone has a report from Sunday, I'd love to hear what kind of day it was out there on day two of the Maui Field Trip. Leaving the door soon for Phillips ridge, to try some midday thermals. Have fun guys, hope to see ya'll soon ! What a SAT'isfying two days of flying. Us Maui guys really appreciate it that you all order up the perfect conditions whenever we come over! Congrats to Abhay, who launched on the east lighthouse side with us and flew in the air for 4.5 hours to finally land in Kaneohe! Wow! I had a fantastic day and managed to keep everything is super control, no reserve moments, and not even any worriesome collapses from the about 30 laps out of the water. Thanks Reaper for the launch assist on a windy Cactus, and getting our two Maui kiteboarding friends out for stellar tandem flights. You da man! At least on Monday, I did manage to make a Tomato Patch launch! Hadta work out a snaggy twig after getting some altitude away from the ridge. (So needless to say I might want to do some launch maintenance when I'm back in December). After launch today it was all about following the locals to Green Wall where I got some nice thermals. Yes, Alex, I agree it was quite a bit of rock-n-roll out there today! At times it felt like the rodeo we get at "The L" on Maui! As always, it was a heckuva lotta fun to fly with you guys!